The Cho Pat knee strap provides many individuals with a marked reduction in the pain and discomfort caused by various knee disorders including chondromalacia patella, Osgood Schlatter’s Disease, runner’s and jumper’s knee. Exterior strap over infrapatella buttress provides laterial and medial patella tracking support. 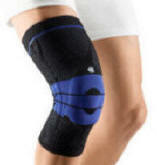 Alleviates conditions of tendonitis, chondromalacia, bursitis, Osgood Schlatters and other knee ailments. This patella strap provides the ideal in therapeutic support - conforming compression without restricting circulation. Use this support to treat symptomatic pain from Chondromalacia patella Syndrome, Patellar Tendonitis, and Osgood-Schlatter's disease. Reduces pain caused by patellar tendinitis (jumper’s knee/runner’s knee) and Osgood-Schlatter disease. Applies constant, mild compression at the patellar tendon through the use of a unique tubular buttress. Easy to apply and effective in treating knee pain. Indications: Patellar tendonitis, patellar tracking, Osgood-Schlatter disease.